Coder Coded Coder Coded - We craft code. Hello. We are Coder Coded. Need an app for Pepper robot? We do full stack, and more. We create HTML5 based, mobile first responsive user interfaces using the latest Web technologies and frameworks like React and AngularJS. When HTML and CSS is not efficient enough, we bring Pixi.js into play. Our cloud service solutions are built on top of Node.js. We can rapidly prototype different approaches, and turn the best into scalable production services. Components vary according to customers needs. 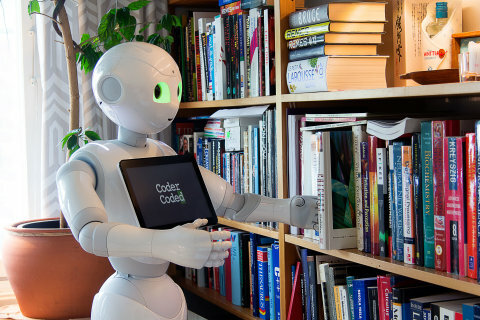 As the first Finnish member of ​SoftBank Robotics Pepper Partners Program, we create cutting edge robotics applications for the most advanced humanoid robot available in the market. We create stunning interactive installations using cameras, video projectors, touch screens and other modern and experimental user interface technologies. We are a team of three highly experienced MSc level programming professionals and enthusiastic hackers. Our personal creativity and skills have slightly different priorities but as a team we make the full stack. NFC-based interactive exhibition booth with Pepper robot at Tubecon 2016 in collaboration with Heureka and Sitra. Installation for the Finnish science centre - Heureka. Are you afraid of bugs? Another installation for the Finnish science centre - Heureka. OpenCV, video projection and some AI. Have us create something for you. Leave your contact details and a message, we'll respond as soon as possible. © Coder Coded 2015. Site template based on Miniport by n33, used under CC BY.